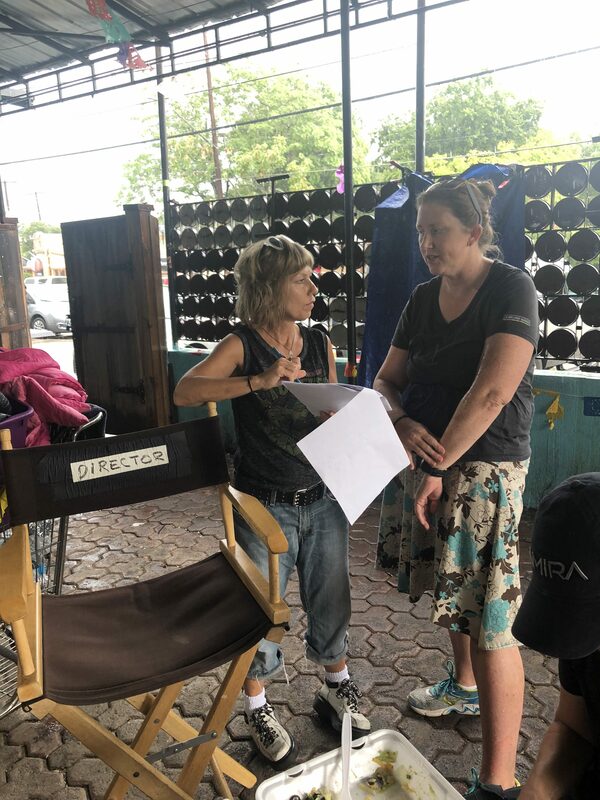 Miles Underwater - Day 5 - 18 beignets & why writers should be on set - Colette Freedman is a top Hollywood Script Doctor who has also ghost written several novels. My friends Stephen McFeely and Christopher Markus wrote the Avengers Infinity War films and they were always on set. It always fascinates me when directors and producers don’t invite writers to set (it happens a lot). I believe this is mostly due to a director’s insecurity or fear. Writers are invaluable. McFeely and Markus were invaluable making last minute changes on a billion dollar film as Purdy and Freedman were invaluable making last minute changes on a film which is many, many, many, many, many, many, many zeros less than one billion. When shooting an indie film, the director and producers are often cutting on the fly. As heartbreaking as that is for the actors and writers, it’s a necessary fact when you simply do not have the money or resources to get all of your shots. Today was a grueling; albeit, productive day when both of our young stars pole vaulted over the already too high bar. But we had too many shots, not enough time to shoot them, complimented by an unwanted torrential two hour storm in the middle of the day. So, we had to make choices and luckily the writers were on set. 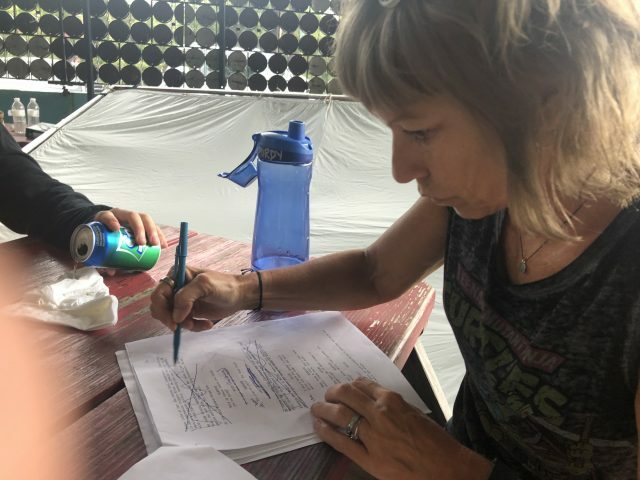 Luckily, Brooke Purdy may be one of the smartest writers on this planet and, within two minutes, easily cut out half a page and deftly cobbled together two scenes which sped up production considerably. 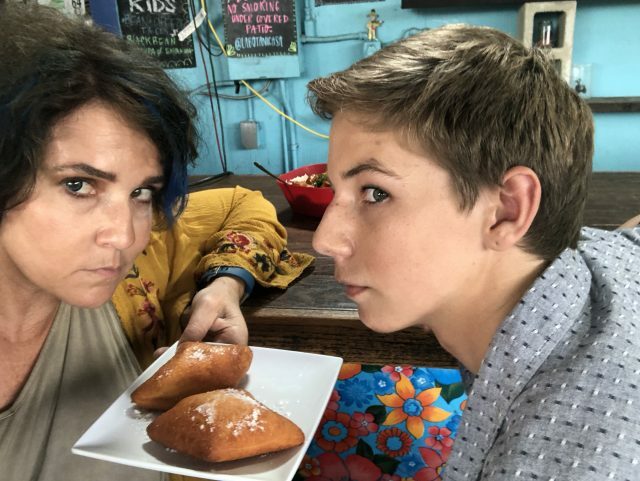 This cut also unfortunately meant that Dodi, my character, would not be eating beignets… she wouldn’t in fact be eating anything. Instead, the important plot point was given to Miles. Now, as a carbo junkie who has been looking forward to eating a beignet on camera for the last four months, I was…in a word…disappointed. However, as I watched Max eat beignet after beignet…. my disappointment turned to relief. He made each bite seem mouth watering, even though he had to choke down 18 beignets in the course of twenty minutes. And these beignets were not piping hot morsels of magic from Cafe Du Monde. They were art department beignets which had been sitting on set all day in 98 degree heat over which the flies were having their own deadly Hunger Games . But Max was a champ. And he devoured the beignets. Over and over and over again. Writers should always be on set. If not to eat complex carbs, then to make important time saving cuts.